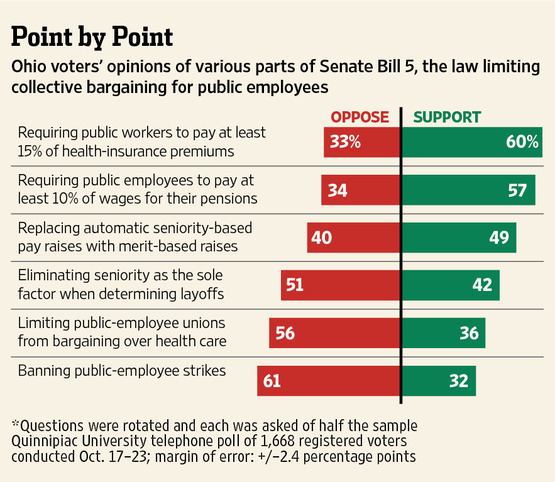 I am sure that union members all over the country are giddy with delight over their effective repeal of Senate Bill 5. In my opinion, it’s too early to celebrate. Prior to the actual vote, polls indicated that Issue 2 would fail, and fail by a large margin. However, that is not the whole story. Various parts of the legislation enjoyed strong support according to a Quinnipiac poll. A chart from the Wall Street Journal (using the Quinnipiac poll data) indicates that three key parts of the bill receive strong support from Ohioans. Ohio still needs more balance between taxpayers and union members. The radical left should not rest. November 8th was Strike One. We have opportunities to control costs borne by the taxpayer. I hope that Governor John Kasich will pursue follow-on legislation that will look to address the issues that can get popular support by Ohioans. He only has one strike. An additional benefit to to this strategy would be the unions spending millions more that would not be available to give Obama a second term.